Another old post from me. This is one of the most visited posts we have, so thought everyone might like to see it again. 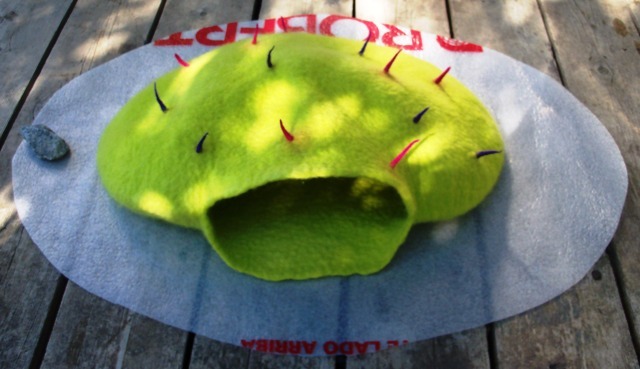 I have been wanted to make a cat cave for sometime now. I decided it needed to be bright. I picked some Blue Faced Leicester wool so it would be strong and dyed it chartreuse. 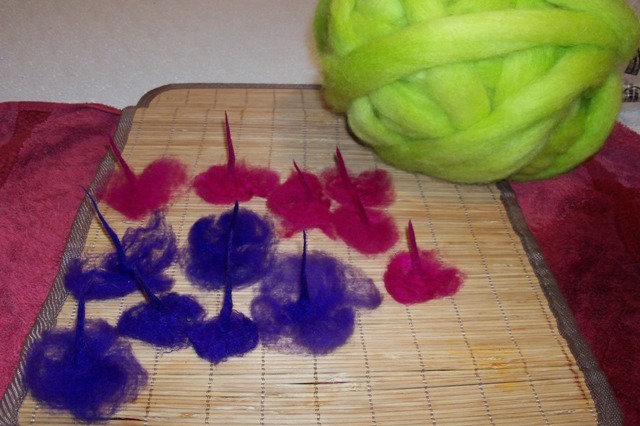 Then I picked some purple and magenta for the spikes. 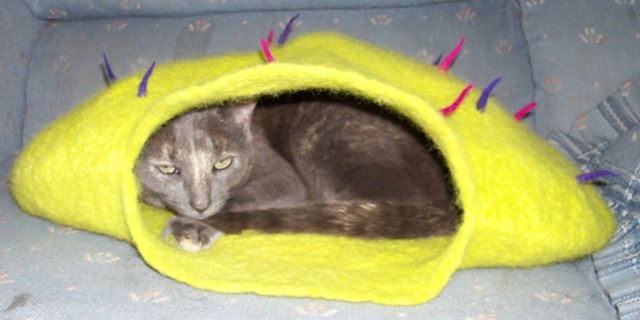 I wanted an oval cat cave. I used my oval hat form to get the shape and gradually sized it up. I laid out 4 layers of wool for strength and even shrinkage. I put the first side aside and after laying out the second side I poked holes to put the spikes through. 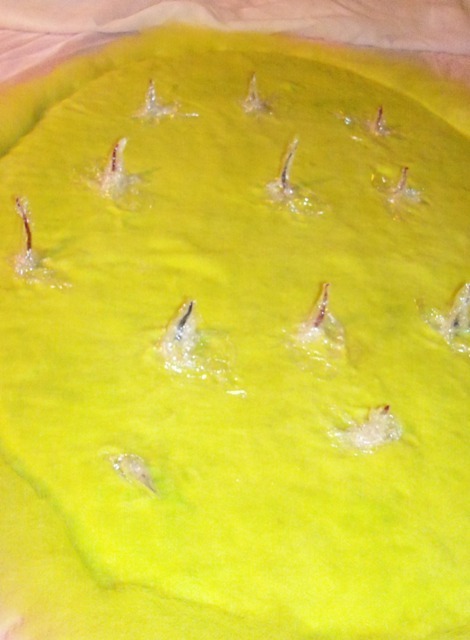 After wetting it all down I wrapped each spike in plastic wrap so it would not get felted down flat. I covered it with a sheer curtain and rubbed both sides for a while and rolled it for a while and then wrapped it up and put it in the dryer twice, changing the position of the felt each time. It was starting to shrink so I cut out the resist and switched to rolling it in a stick blind. I find the stick blinds to be very aggressive and shrinks felt quickly. I did do some throwing too. Finally I rinsed the cave out in a bucket of alternately hot and cold water being quite aggressive with it. 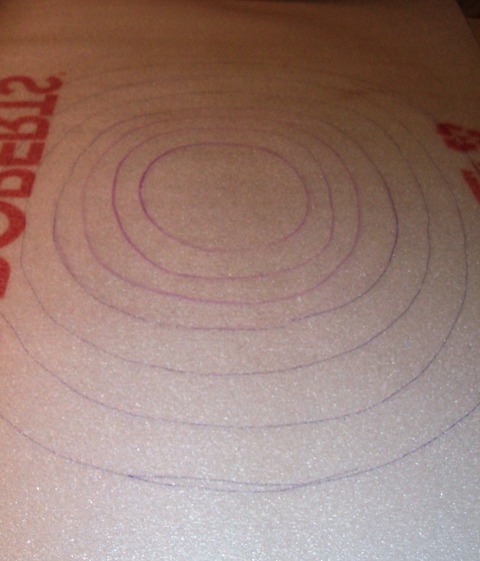 I then had to stretch the top so it would be domed up. I steamed it to heat it up and make it easier to stretch. Mostly I used a wooden spoon to push in a sliding motion to get the shape. Here it is on top of the resist so you can see how much it shrank. Here it is in use, it didn’t take long for one of my cats, Wu, to take up residence. As a foot note Wu ( queen of all things) is no longer with us. This is one of my favourite pictures of her. She really like the cave and we buried her in it, here on the farm.